LOS ANGELES – Fresh off a tremendous first event in Pasadena, CicLAvia is pleased to announce that Culver City and Venice will be the coolest spots of the summer when CicLAvia returns to the Westside for the first time since 2013. 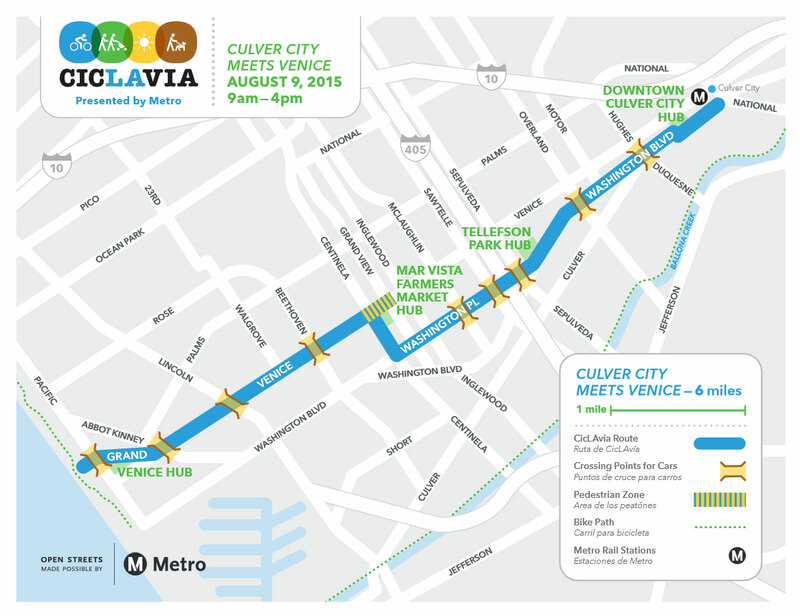 CicLAvia – Culver City Meets Venice Presented by Metro takes place from 9:00 a.m. – 4:00 p.m. on Sunday, August 9. The route will be a six-mile variation of the previous CicLAvia Westside route, allowing participants to explore more of Culver City’s charming neighborhoods, eclectic businesses and delicious restaurants, as well as connect with such Westside treasures as the Mar Vista Farmers Market, Abbot Kinney and Venice Beach. “Participants will actually be able to walk or bike to the beach for the next CicLAvia, which is really cool – in more ways than one – during the summer. We’ve got both sides of Venice this time as opposed to 2013, and we’ve gone from five to seven hours as well. It’s a comfortable route connecting the great neighborhoods of Venice, Mar Vista, Palms with dynamic Culver City seamlessly and without cars. I’m excited that participants will be able to explore widely diverse neighborhoods, discover new businesses and even enjoy a dip in the Pacific.” said CicLAvia Executive Director Aaron Paley. “Culver City looks forward to welcoming cyclists from all over the region to our community! We’re excited to once again partner with CicLAvia and the City of Los Angeles to host this August’s Open Streets event,” said Culver City Mayor Micheál O’Leary. “Ever since the very first CicLAvia on 10/10/10, I’ve dreamed of bringing this outstanding event to Culver City. Thankfully, the small but successful Culver City CicLAvia hub in 2013 paved the way for this year’s ‘Culver City Meets Venice,’ tying our Westside communities together in a beautiful car-free celebration. I want to personally thank Metro, CicLAvia, and our staff for making my dream come true!” added Culver City Councilmember Meghan-Sahli Wells. Metro awarded Culver City an Open Streets Grant to make this partnership with CicLAvia possible. The funding is part of a $4 million Open Streets grant that was awarded to municipalities throughout Southern California to sponsor car-free events from 2014-2016. The program allocates $2 million annually for these types of events within L.A. County. The program seeks to increase sustainable transportation mode share, including transit, bicycle and pedestrian trips, create opportunities for first time transit usage, and encourage cities to develop multi-modal polices. Other benefits include economic advantages, public health benefits and opportunities to highlight and promote cultural resources. CicLAvia – Culver City Meets Venice Presented by Metro is the third CicLAvia event of 2015. CicLAvia – Heart of LA rounds out this year’s routes on October 18. CicLAvia has held 13 open streets events since 2010 and is recognized as being a world leader in transforming streets into temporary urban parks. Hundreds of thousands of people have participated in CicLAvia as they connect with their communities, businesses, healthy activity and each other in a way that isn’t possible by car. Video: single-door versus all-door boarding!